[…] list information about VMs, CPU, Memory, Disks, Partitions, Network, Floppy drives, CD drives, Snapshots, VMware tools, Resource pools, Clusters, ESX hosts, HBAs, Nics, Switches, Ports, Distributed Switches, Distributed Ports, Service consoles, VM Kernels, Datastores, Multipath info and health checks. With RVTools, you are able to search information, dig for inconsistencies in environments or just to export the results to keep an inventory of the infrastructure’s state: the result is available in the form of an array with multiple tabs. A possible use case would be a scheduled task that would launch it regularly, exports the results with the date in the export filename. The command line parameters are well documented and described in the documentation. 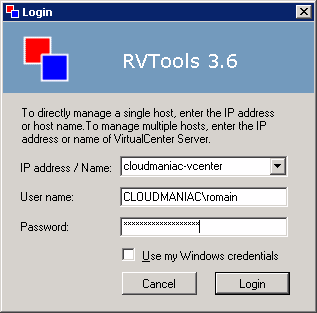 You can find the documentation here or in RVTools installation directory. ESX Server 3.5, VirtualCenter 2.5, ESX Server 3i, ESX Server 4i, VirtualCenter 4.x, ESX 4.x, VirtualCenter 5.0, VirtualCenter Appliance, ESX 5.0, VirtualCenter 5.1, ESX 5.1, VirtualCenter 5.5 and ESX 5.5. Thank you for the post. I had the same idea as you. I have implemented the automation of RVTools exportation task and committing of the file in our SVN repository without further ado. could you please share, what are the steps followed to for the utomation of RVTools exportation task. I am able to run this without any issues from the command line but am hitting a wall when trying to use Task Scheduler to run the same .cmd file that works at the cmd line. One thing I have noticed is I need to be in the RVTools directory on the C drive and run the file using the path to the .cmd from there. I have thought it is because of the RV Tools directory location c:\program files (x86)\robware\rvtools and not being able to CD c:\program files (x86)\robware\rvtools to it. I’m sure I am missing something obvious as I’m a VMware person and don’t use Windows CMD very often. you need to replace the path with the actual path of the RVtools installation. It may differ between installations. Could you please send the script and steps in email. many months of hard work due tto no backup. Do you have aany solutioins to stop hackers?